James Alan Shelton Clinch Mountain Guitar download free. Ralph Stanley’s current and former guitarists in a program of Clinch Mtn. Boys classics, with a particular emphasis on crosspicking and how to apply it to tunes, song accompaniments, turnarounds and more. The boys play “Banks of the Ohio,” “Cannonball Blues,” “Tom’s Creek,” “Road to Coeburn” and more – all the music is transcribed to note/tab in the accompanying book. 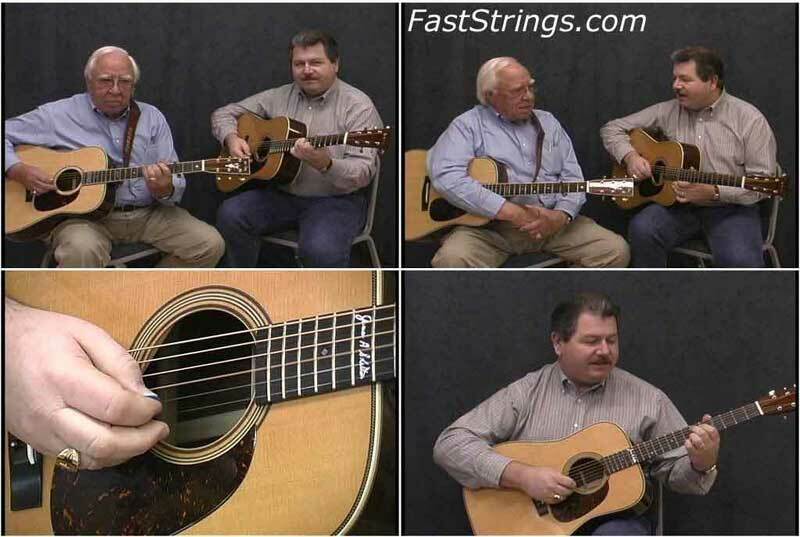 In this one-hour instructional DVD James Alan Shelton and George Shuffler demonstrate and teach the guitar techniques that helped change the role of the guitar in bluegrass music. The music of the Stanley Brothers and Ralph Stanley and the Clinch Mountain Boys has featured lead guitar work since Bill Napier and George Shuffler brought the guitar to the forefront of the Stanley’s music in the late 1950s. This video begins with James Alan Shelton, the current lead guitar player for Ralph Stanley and the Clinch Mountain Boys, picking a tune with the legendary George Shuffler. James then interviews George regarding the development of his “crosspicking” guitar technique. George demonstrates the technique and provides a guitar solo to one of the tunes he helped to make a bluegrass standard, “Will You Miss Me.” George and James then pick “Katy Dear” together and demonstrate their crosspicking talents. The instructional portion of the video begins with James Alan Shelton demonstrating the crosspicking roll and providing several exercises which will serve to train your right hand to gain skill with the crosspicking technique. James then teaches a “turnaround” to “Rank Stranger” which utilizes the crosspicking technique to “fill in the gaps” between vocal lines. He then shows how to take the simple melody line of a song, “Uncloudy Day,” and incorporate the crosspicking technique between the melody notes. Next, James teaches a crosspicking break to “Bury Me Beneath the Weeping Willow” and follows that tune by demonstrating how to transform a Carter style guitar solo into a crosspicking solo using the song “Wildwood Flower” as an example. The next section of the video features James teaching two of his original flatpicking tunes “Road to Coeburn” and “Tom’s Creek.” This is followed by a fingerstyle performance of Ralph Stanley’s favorite guitar number, “Cannonball Blues.” James concludes the instructional portion of the video by talking about his selection of guitar strings, picks, and capos and provides “tricks of the trade” to help you keep your flatpick in good shape. George and James both talk about their signature model Huss & Dalton guitars and the video concludes with George and James picking “Banks of the Ohio” together. All of the songs that are taught in the video are transcribed in the accompanying transcription book. I have found some of the most amazing and unique items on this site.